And that’s precisely how I found myself sitting on the couch, reading Lewis’ Chronicles to my not-quite-four-year-old son several years before I intended to. We’re only 68 pages in so far (only—ha!) after a few evenings and a car ride, but we’re making progress. Of course, I don’t expect he understands even half of the words I’m reading to him, and I’m sure his mind wanders to places both less and more interesting than Narnia, but you should see him while I’m reading: his head on my chest, his fingers absentmindedly tracing up and down my arm, leaning forward to examine the small black-and-white line drawings that punctuate the text every few pages. Maybe it’s only the sound of my voice, or the feeling that he’s a big kid after all. Whatever it is, he’s loving it. To tell the truth, whether or not he actually gets it yet—some of it, or most of it, or even none of it—doesn’t much matter to me. I believe that the stories we tell our children are fantastically important to their development, particularly to the development of their worldview. 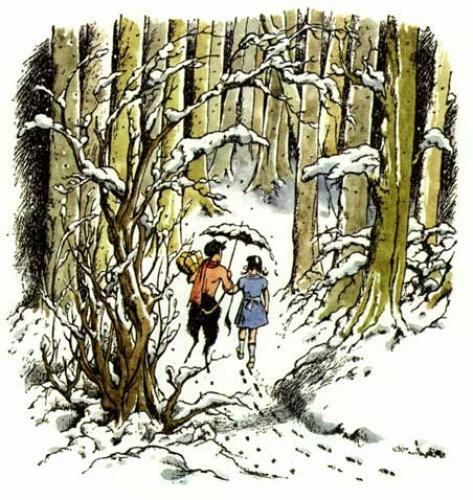 And as far as I’m concerned, Jack couldn’t do much better than Narnia. This story and others like it are the stories that I want shaping my son, even if he isn’t quite old enough to understand them fully. I’m convinced that if I marinate him in these stories long enough and often enough, the flavor will seep in unawares. He’ll learn, for example, that Lucy insists on telling the truth when everyone else thinks she’s a liar, or mad. He’ll learn that Aslan isn’t safe but he is good—and that there are many such things in this world. He’ll learn of the Deeper Magic that undoes the world’s evil when an innocent king gives himself up in a traitor’s stead. This is much more than simply using Narnia as an evangelism tool. I know people who do that, and shame on them. For my part, I don’t plan on surprising Jack with a presentation of the gospel when Alsan rises again from the Stone Table. (I teach Jack about the gospel, to be sure, but I have The Jesus Storybook Bible for that. There’s no need to ruin a perfectly good story.) In fact, I think the parents who use Lewis in this way entirely misunderstand the power of these books. They have magic, not because they’re about Jesus but because they’re about Aslan; not because they’re secretly about the Real World, but because Narnia is secretly Real. What I mean is that the Narnia stories, to co opt the words of Michael D. O’Brien (and here I return to my second Storytime post), clear away “the rampant undergrowth of details that make up the texture of everyday life, that crowd our minds and blur our vision… so that we see clearly the hidden shape of reality.” I don’t need Lewis to teach my children the Christian story. But I do need Lewis to teach my children that we live in a world in which the Christian story makes sense. David Mills writes in “Enchanting Children”: “I think that a story in which the Christian mind and imagination are assumed may make the world in which the original stories happened more plausible to us, and therefore may help us see the originals ‘in their real potency.’” To be fair, Mills believes Lewis is far too heavy-handed in The Lion, the Witch and the Wardrobe, but the point, I think, is the same: It is only by reading about the world of Narnia (and other similar worlds) that we can cultivate the Christian mind and imagination in our children. Some children seem to be impervious to even the most obvious lessons, but in general, a child who spends time in a good writer’s world will find his imagination formed by it, at least a little. A good story will not make him good, but it should help him understand goodness a little better and make doing good a little easier by making it feel more normal. It will teach him that the world is this kind of place and not that kind. This is the true Deep Magic of the books—that they give us eyes to see a world in which the the whole of the Christian story (creation, fall, redemption and eventual consummation) stands firmly and coherently against the persistent narratives being peddled by an unbelieving world. Good stories allow our children to do the same. Wow. What a great post from an amazing writer!